This summer, British Christian writer Symon Hill will walk from Birmingham to London as a pilgrimage of sorts. He is walking 160 miles to repent for his former homophobic attitudes and beliefs. Hill admits he used to campaign against gay ministers and Christian acceptance of LGBT people. He has since become convinced that he was wrong. Taking a circuitous route between 16 June and 1 July, I will give talks on the way, challenging the Church as a whole to repent of homophobia and to think differently about sexuality. I will be praying for God's guidance and engaging in dialogue with those who disagree. Churches in Birmingham, Oxford and London are to host events in June and July encouraging Christians to repent of homophobia and support full equality for gay and bisexual people. All three churches will host talks by Symon Hill, a Christian writer who is walking 160 miles on a pilgrimage of repentance for his former homophobia. The pilgrimage has been welcomed by the former Bishop of Oxford, Richard Harries, and the human rights campaigner Peter Tatchell. A call to Hill revealed that the churches mentioned in the email are "neither Church of England nor Roman Catholic. They are Methodist, Reformed and Baptist. So still churches, just not the right ones." I would argue that any churches are "right ones," but I do share the sentiment that this amounts to preaching to the choir. It has been harder than expected to find churches willing to host me. There have been churches who were very interested but later found the congregation or the vicar to be opposed to the idea. There are lots of people who support inclusion but avoid talking about for fear of creating a row. Luckily, there are people like Hill willing to force the discussion. Along with the ednorsements from organisations, I continue to be humbled by the emails and comments I recieve from individuals. This evening, I recieved an email from a Christian mother of two adult children who are both gay Christians. She is proud of them, accepts their faith and their sexuality, and works with a support group for Christian parents with LGBT children, some of whom have difficulty reaching a position of acceptance. I am only one of many, many people in Britain and around the world who are inspired by the radical inclusivity of Christ to work for the full equality of gay, lesbian, bisexual, asexual, transgender, intersex and queer people within Christiainity. I do not think I could do what I am doing without the support of others, and I thank God for all of them. 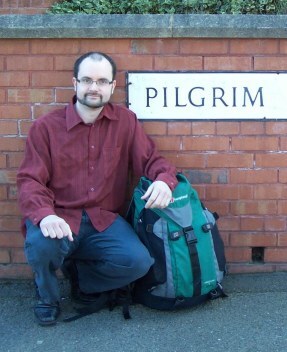 For more information on Symon's pilgrimage, see his blog here.